Meet our 2019-2020 District 5040 Governor, Bala Naidoo. He is a member of the Rotary Club of Burnaby Metrotown. A financial planner by profession, Bala brings a wealth of knowledge to his role as our DG, a leader that lead us through "Change Readiness". We talked about planning, vision, rewards, in particular the action plan. we looked at some case studies, highlighted People of Action, resistance to change, the journey ahead. The PowerPoint used was one the best this writer has seen. Using RI's resources from the website, Club Central (only effective if we use them) tracking our volunteer hours were highlighted, small things that will make a difference. The day long session did not seem to be all that lengthy. All those attending were sparked by the message he shared. Sunday was spent with our Past District Governor Don Evans as he walked us through the what is it of the Rotary Foundation, when and why it started, recognition for those who make contributions, who can contribute to it, the ABC's of our foundation. 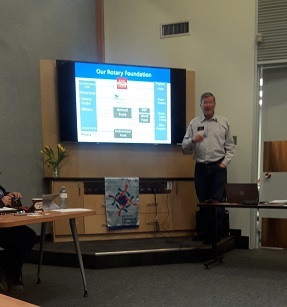 In this photo you see Don with his 'go to' slide behind him, the Rotary Foundation Grants, the two different biggies, District and Global, and some further arms that do make understanding easy. We talked about good stewardship, heard examples. and shared stories. Another well presented assembly. At the end those attending were given the paperwork to take back to their club to be signed with their club president and president elect's signatures, the proof they had completed this step so their clubs can apply for a Foundation Grant this upcoming Rotary year. These are to be returned to Don.